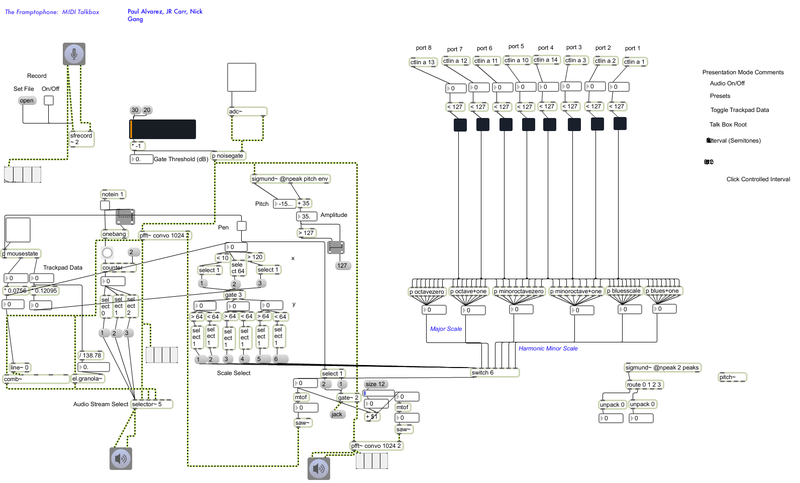 For this project, my group created a vocoder synth using Max MSP. We accomplished this using MSP’s Fast Fourier Transform functionality. 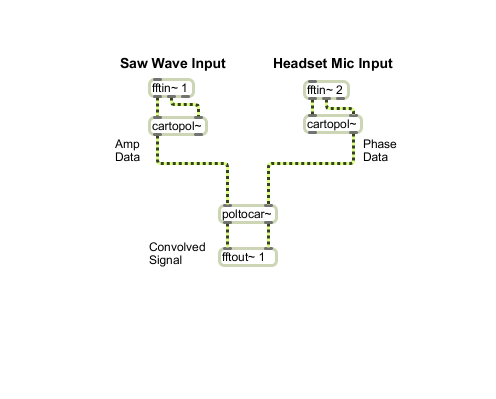 Using the pfft~ object, we were able to convert inputs from a headset microphone and digital saw wave from the frequency domain to the time domain. These signals were then converted from Cartesian to polar coordinates using the cartopol~ object. This object sends out two outputs, the amplitude and phase of the input signal. We were then able to convolve the two signals by feeding the amplitude of the saw wave signal and the phase of the microphone into a single poltocar~ object (the reverse of cartopol~). The convolved signal was then converted back into the frequency domain for the final vocoded signal. The interface for this project consisted of a fiberglass board with 8 FSR’s, 1 binary push button, and a WACOM Bamboo pen tablet as well as one Logitech USB headset microphone. The FSRs each controlled the pitch of the saw wave by selecting a degree of the scale chosen by the user. The microphone was used to collect the spectral information of the performer’s voice. The pen tablet’s function was to control the musical scale played by the FSRs as well as octaves, harmonies, and the pitch shifter. The pen’s x position above the tablet would trigger a major scale when all the way to the left of the tablet, a minor scale when in the middle of the tablet, and a blues scale when all the way to the right of the tablet. Changing between scales was best achieved by performing a flicking gesture with the pen across a given scale threshold. The y position of the pen had two functions in the patch. 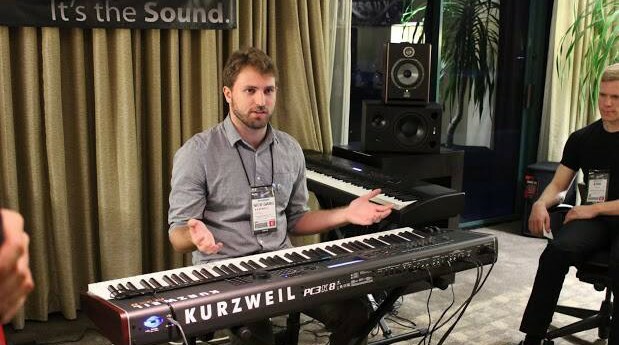 The first of these was to switch between the two possible octaves. This was done by flicking the pen up and down across the middle of the tablet to transpose the signal up and down 12 semitones. The other function of the y position was to control the pitch and sample index of a granular pitch shifter object (el.granola~). This pitch shifter effect was toggled on and off via a binary push button mounted to the fiberglass. 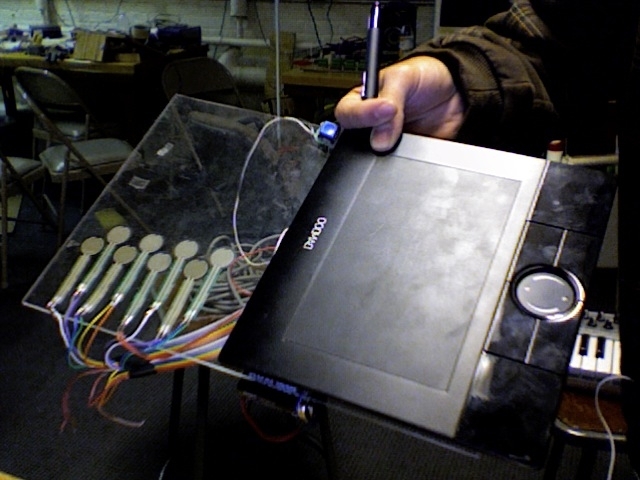 The last function of the Pen tablet was to add a harmonizing voice when the pen contacted the tablet. 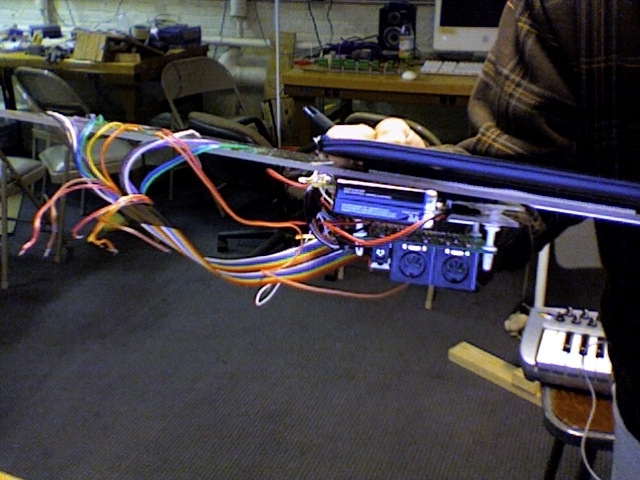 This was accomplished by running the audio stream to another pfft~ object with a saw~ object whose pitch was n half steps above the pitch chosen by the user. In this case, n was a number from 1 to 12 that was controlled by a slider in the Max window.